Leigh-Anne Pinnock instagrammed a picture a few days ago wearing an OnePiece Mould Jumpsuit ($69.00) with Chanel CC Logo Leather-Suede Snealers ($1,600.00). Jordyn Jones posted a snapchat photo today from behind the scenes of her new music video shoot wearing the OnePiece LA College Onesie ($54.00, navy only), a Wildflower Babe iPhone 6/6s Case ($35.00), and her favorite Converse Chuck Taylor All Star Core Hi Sneakers ($55.00). 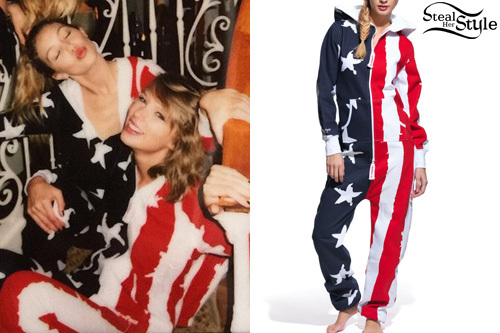 Gigi Hadid posted a picture of her and Taylor Swift celebrating the 4th of July, both wearing the OnePiece USA Onesie Stars and Stripes ($179.00). Ariana Grande met with fans at the Honeymoon Tour in Amsterdam wearing the Forever 21 Flower Cat Ears Headband ($4.90) and the OnePiece Slim Stretch Cotton Jumpsuit ($171.00). Get the look for less with a blue onesie from Boohoo ($30.00). Jasmine Villegas wore the OnePiece Original Slim Onesie Wine Purple ($149.00) in an instagram photo last week. Becky G celebrated Christmas last week wearing a OnePiece Aviator Onesie in Navy ($229.00) with a pair of navy blue UGG Australia Classic Short Boots ($154.95). 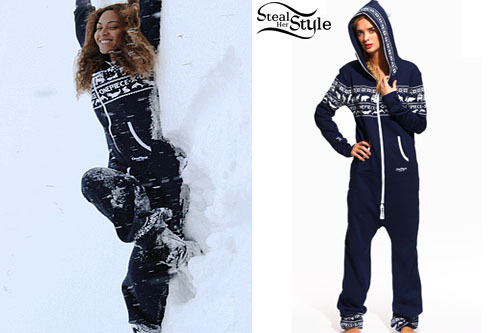 Beyoncé posted a new photo on her website today of herself in Iceland wearing a OnePiece Snowball Midnight Blue Onesie ($179.00). Leigh-Anne Pinnock was spotted arriving at the recording studio with her bandmates wearing a River Island Black Truth Amour Paris Print Tank Dress ($44.00), the Onepiece Kajsa Tights ($69.00), a Zara Green Crossover Jacket (Sold Out), a Dune Dlocket Crossbody Bag ($46.00), the Chanel 5208Q Tortoise Sunglasses (Sold Out) and a pair of Office Black Rocco Pumps (Sold Out).